Everybody likes to have a good laugh every now and then, and hilarious videos are without a doubt one of the best ticklers of one’s funny bones. They could brighten anyone’s, young and old alike, mood in mere seconds and could really help you unwind after a stressful day at work or school. This is why it’s no surprise that a lot people are also beginning to use apps that center solely on serving as a platform from which you can play funny videos anytime and anywhere you like. Best Funny & Prank Videos is but one of the said apps, for it offers funny videos of various kinds that would ensure that you would certainly laugh, whatever your sense of humor is. The collection of videos is vast, to say the least. What’s even better is the fact that the app has taken the time to organize its numerous videos into categories. 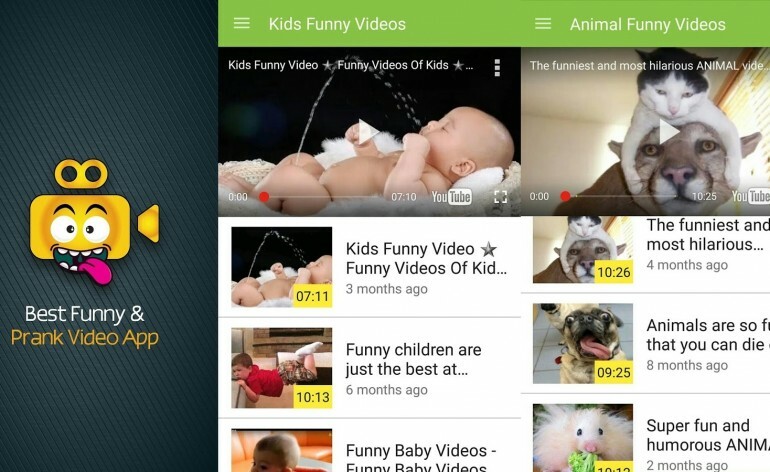 Besides having a New Videos section, where you can easily watch the videos that were recently added to the app, there are also categories that range from Funny Videos (which is pretty much like the General category of the app) and Kids Funny Videos to Animal Funny Videos and Funny Prank Videos. Majority of the videos are shared directly from Youtube uploads. Every video is listed Youtube-style as well as each one comes with its respective title, duration, thumbnail, and date of addition and upload. Once you click on a video, it would appear on the top portion of the interface, ready for limitless playbacks. Many of the videos are compilations themselves of various hilarious scenarios, candid recordings, and even feature clips from actual shows like America’s Funny Home Videos. Each one can be easily sorted into the said categories so you would certainly be able to get to the ones you like in no time. Of course, the ultimate value of the app lies in its serving as a platform from which you would be able to have ready access to videos that would keep you gleeful and entertained all throughout the day. Many apps serve a primarily curatorial purpose, but Best Funny & Prank Videos obviously focuses more on delivering amusing and entertaining videos to its users. This is what evidently makes it stand apart from other apps that function in a similar way. The fact that the developers of the app takes the time and effort to categorize their videos is one other plus side that only serves to define the quality of this app.